I love stories, always have; give me a book, and I’m a happy man. It’s not surprising, then, that I always appreciate games with strong, emergent stories that seamlessly mix with the gameplay. Yet, all too often many of the games I play show a distinct disconnect between story and gameplay or contain any story elements in the few, obligatory cutscenes. Don’t get me wrong, I also like games with fantastic gameplay and nothing else, but the games that stick with me are those with great stories. Fortunately, there are those rare occasions, those rare games whose story and gameplay are so intertwined that they blend beautifully. Transistor ($4.99), Supergiant Games’ second game, is precisely one of those rare occasions where the story emerges from the gameplay and the gameplay emerges from the story, one of those rare games that prove the importance of cohesiveness in narrative and gameplay. That cohesiveness made Transistor one of my most memorable gaming experiences in quite a while; perfect it is not, but it is a fantastic experience that most iOS gamers will really enjoy. In Transistor, you play as Red, one of the most fascinating female protagonists in recent years, who yields a huge sword, the titular “Transistor." I’ll keep the story details to the barest of minimums because the game’s narrative hinges on the player uncovering the events that led to Red’s current predicament. What you do need to know, though, is that the story utilizes a very common story-telling device, starting in the middle of a story (called in medias res in literary terms) and then retelling the past. This kind of device often requires lengthy amounts of exposition often from a character describing the previous events or from the well-worn device of the “found story," where the player encounters a massive amount of books and computer files that miraculously give the player all the information he needs. 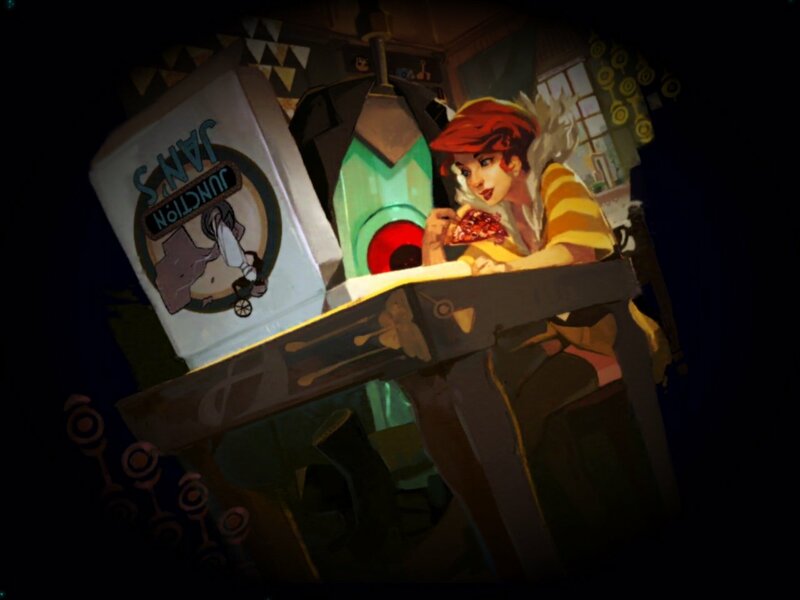 Even though the world of Transistor abounds with story-telling terminals, they don’t dictate the past story as much as they re-create Red’s world before the current events took place. Yes, they do offer the occasional snippets of background story, but when they do, they do so in a way that doesn’t feel artificial. Even more importantly, you get a lot of the story from the talking titular sword that subtly helps set the scene for the current events. That voice doesn’t just narrate but, rather talks to Red as a friend would. So, the ways Transistor delivers its narrative don’t feel forced but, rather, fit perfectly within the world Supergiant Games created. 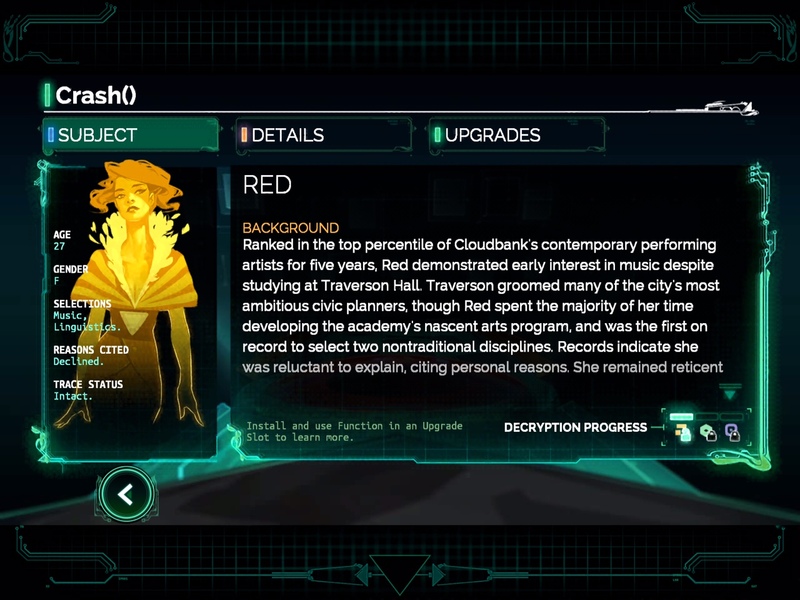 Speaking of that world, Transistor’s Cloudbank city is probably one of the most vivid gaming environments I’ve encountered, brimming with a distinct and cohesive style that really gives the impression of a place designed by people – albeit futuristic ones – who had a specific vision in mind and then realized it. You view the city and Red from an isometric point of view that allows you to enjoy Cloudbank’s architecture and environments, even if occasionally the buildings in the foreground hide Red from your view, which can be somewhat irritating during moments of intense combat. Also, I often found myself wishing that the game was zoomed in a bit more because sometimes Red and the enemies were on the small side on my iPad. Despite these small issues, I would occasionally halt in the middle of a city square just to take in the surrounding view. 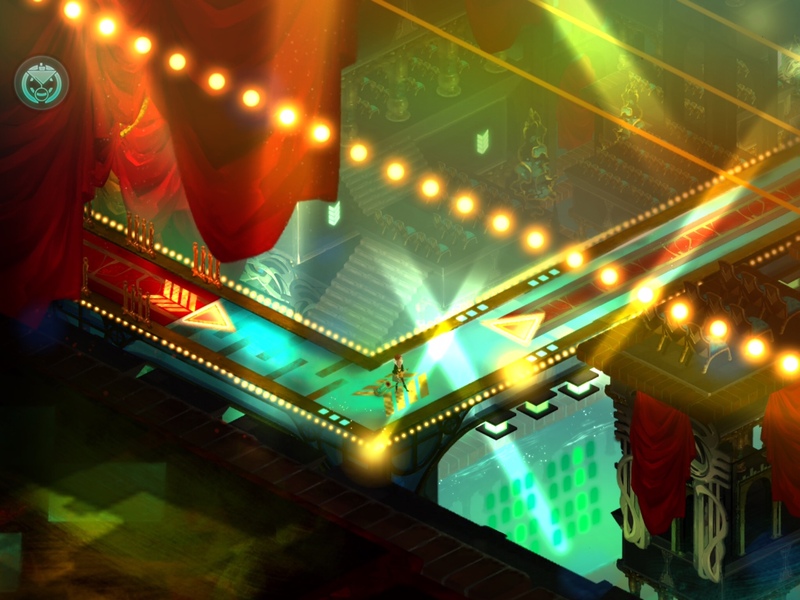 I also very much enjoyed the color palette employed in Transistor. Futuristic cities are often realized in stark silvers and grays, or in dark, grimy textures; Cloudbank, though, is a vividly-colored place bathed in multicolored lights and filled with floating particles that enliven it. Red and her sword are also fantastically colored and drawn, with every detail of her clothing and her sword standing out because of the great use of contrasting colors. The animations are also lovely, with smooth motion throughout, and the enemies are animated in such a way as to exude personality simply by the way they move and attack, even if that enemy is a chicken egg with feet. In addition to being animated well, the enemies you face are also well-thought out, with a variety of abilities that get upgraded as the game progresses and that demand very different tactics from the player. When Red encounters any of these enemies, the game switches to its battle mode. A certain portion of the level is enclosed by an invisible wall, and columns rise from the floor to form walls that offer Red cover from enemy fire. The battle combines real-time and turn-based elements in a great hybrid that gives the game a frantic yet tactical pace. While you can fight the whole battle in real time, most battles will demand that you “freeze" the battle and plan your moves in the Turn() mode. 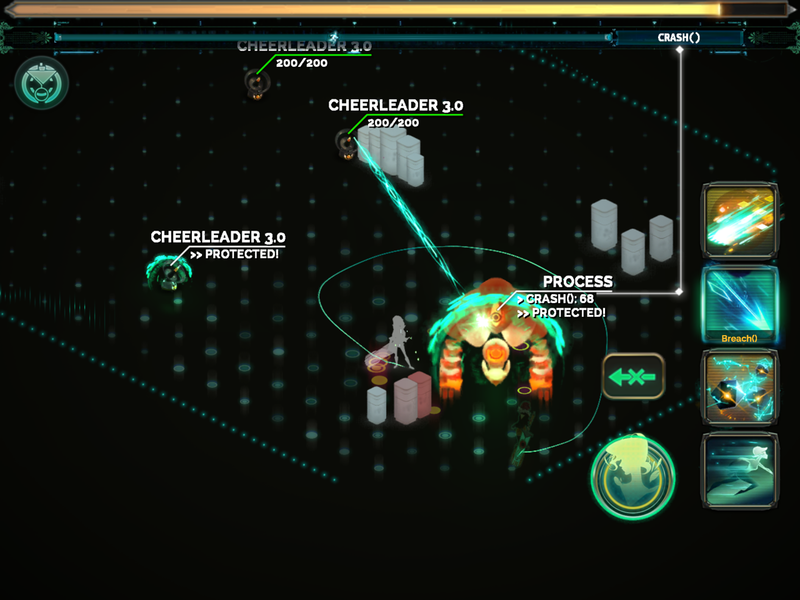 While in this mode, the enemies are frozen in place and you get to plan your moves and attacks. There’s a limit to your moves and attacks each turn, so when the action bar is empty, you unfreeze the game and see your battle plan executed. Then, you try to protect yourself and get in a good position while waiting for your action bar to refill. I found the battles to be tactical to the right degree; not too complicated, not too simple. The game utilizes unit facing, which makes backstabbing an enemy more devastating than attacking from the front. Also, the game lets you pull off some brilliant maneuvers like getting an enemy shield generator to briefly switch sides and protect you from enemy fire. While the enemies are very well-designed, I would have liked a bit more variety instead of facing the same few enemies with slightly different abilities each time. 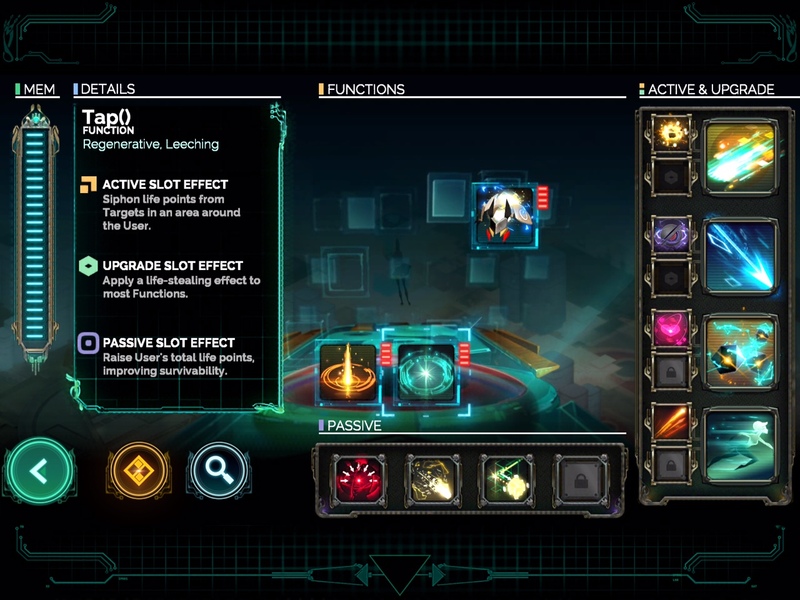 Many of the enemy “bosses" are also placed slightly haphazardly in the game; not knowing where you’ll encounter a boss makes for an unpredictable game, but, at the same time, Supergiant Games could have used a few more bosses as a narrative device to strengthen the already-powerful narrative even more. 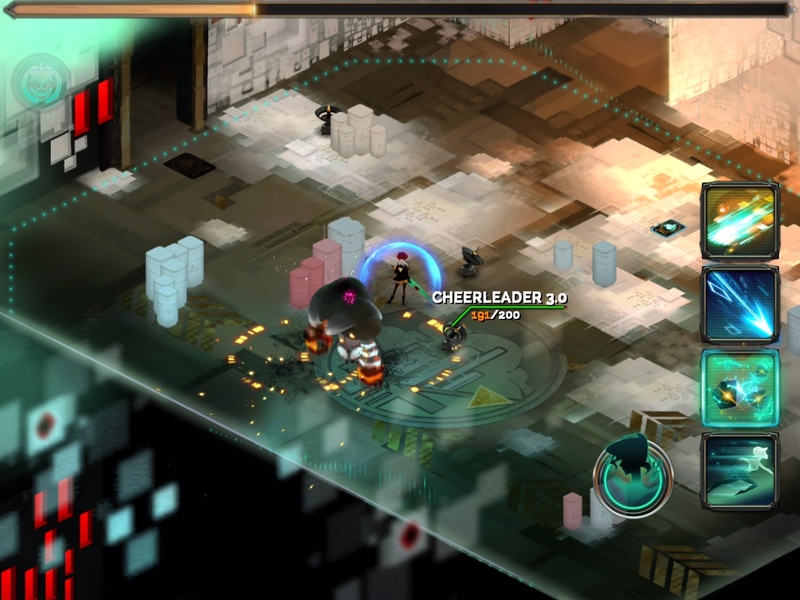 The RPG elements of the game are found in Red’s “functions" (Transistor‘s word for skills), which provide an abundance of ways to fight the enemies. As you level up (and also when you meet certain key characters), you get new functions like Spark(), an AOE attack, or Crash(), a disruptive attack. The intricacies of the function system stem from your ability to insert a function either in an Active Slot, an Upgrade Slot, or a Passive Slot. Each function behaves differently depending on the slot you use it in. So, considering that you have over a dozen functions and that each active function can have up to two upgrade slots, you can imagine the great number of possible combinations and, therefore, the great number of ways you can play Transistor. For instance, I have Spark() in one of my four Active slots and have Switch() as an upgrade to Spark(). The result is that instead of Spark() damaging my opponents, it has now become an AOE attack that temporarily forces enemies to fight on my side. The game’s function system offers plenty of replayabilty as it enables you to play through the story using dramatically different battle strategies if you so desire. Considering how complex the game’s battles can get and the tight maneuvers often required, players need to be able to control Red accurately, and, fortunately, Transistor‘s controls work well. You can either play the game with a floating virtual stick, which works fine both in and out of the battle mode, or you can play with a mobile-oriented control scheme that replaces the stick with tap-to-move. This control scheme works better on an iPhone than an iPad, but it still works. Personally, I played with the virtual stick on my iPad and had minimal issues controlling Red and her sword. I did notice a tendency for the game to misread my taps when choosing various skills to level up, but other than that, the game controlled fine. I’ve seen people in the forums and the comments complain about the game’s difficulty spikes, but personally I’ve had no such issues. Yes, I found the game’s difficulty to be a bit too random, but it never varied too much in too little time. Instead, what gave me more difficulties while playing the game were some very, very bad slow-downs when I would battle against many enemies at once. In one specific moment, I thought the game had frozen completely only to find Red standing across the screen about six seconds later. In general, although the game plays fine on my iPad Air, I did encounter plenty of slowdown moments that I hope can be fixed in a future update. They didn’t get me killed, but they very nearly did. I’ve left any discussion of the music and voice-over last to give those aspects of Transistor the emphasis they deserve. Darren Korb’s music is astounding, rich and evocative as it echoes across the game and perfectly complements the bright yet mysterious world of Transistor. Red’s humming often accompanies the game’s music, creating a mournful tone that evokes the protagonist’s mourning over her lost voice and devastated life. As for the voice-over narration, Supergiant Games does in Transistor an even better job than in the already-great Bastion. Bastion had a constant narration that accompanied your actions. Yet, while in Bastion the narrator’s voice was pretty much outside the game’s story (even though you meet the character whose voice you hear), in Transistor the voice-over is inherently tied to the game’s story as it’s the voice of another character who’s trapped in your sword. As you play the game, the sword’s voice guides you through your adventure but also debates with you, often judging your choices and struggling to change your mind. This interaction of the voiceless protagonist and the voice in the sword brings the game to life in a manner that really makes Transistor‘s narrative techniques stand out. One could even go further and discuss issues of disempowerement as represented by Red’s lack of voice, but if I went down that path, I would probably need another two or three thousand words. What I will say, though, is that Supergiant Games obviously put a lot of thought in figuring out the role of the sword in the game both in terms of story and of gameplay, and I appreciated that. Very often game designers result to gimmicks, but very rarely are their design choices so interesting and also so successfully implemented. As you can probably tell, I really enjoyed Transistor because I think it’s a masterpiece in game design where all aspects of the game are of the highest quality and also work together harmoniously. I know that some have criticized the game for being on the short side, but it took me quite a few hours to complete. 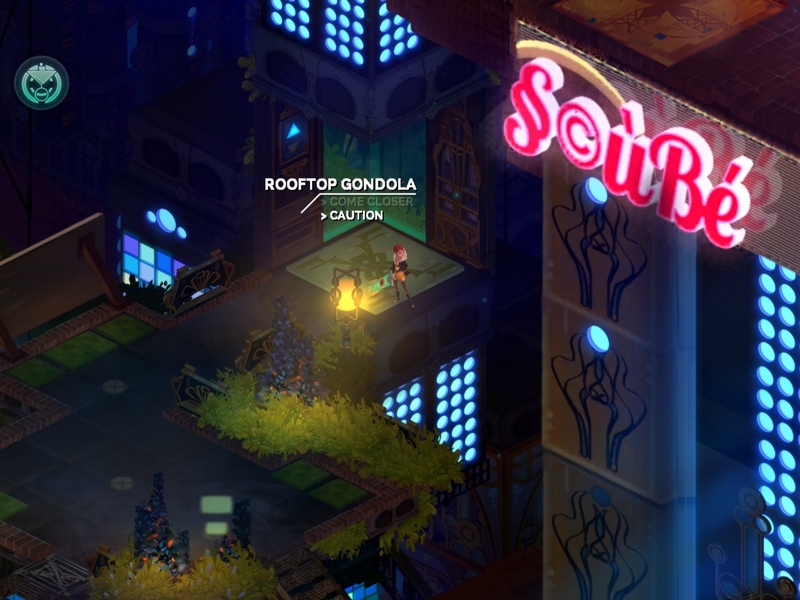 Granted, I took my time reading all the information about Cloudbank and exploring every nook and cranny of the world, but I didn’t do so because I was reviewing the game but, rather, because I really enjoyed Supergiant Game’s world-building. You can enjoy the game simply for its battle system, or you can play it to experience its fantastic story. 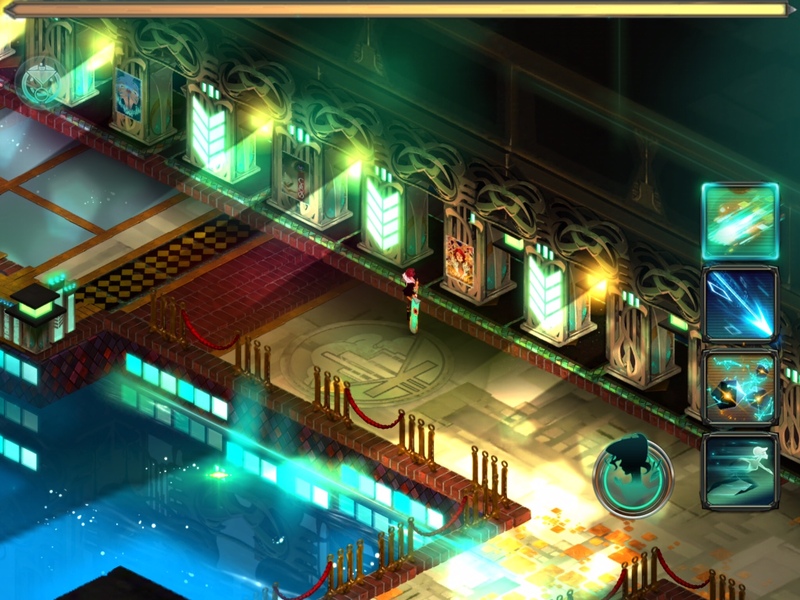 Either way, despite its many slowdowns and the lack of enemy variety, Transistor is a gem that should be part of most iOS gamers’ collections.